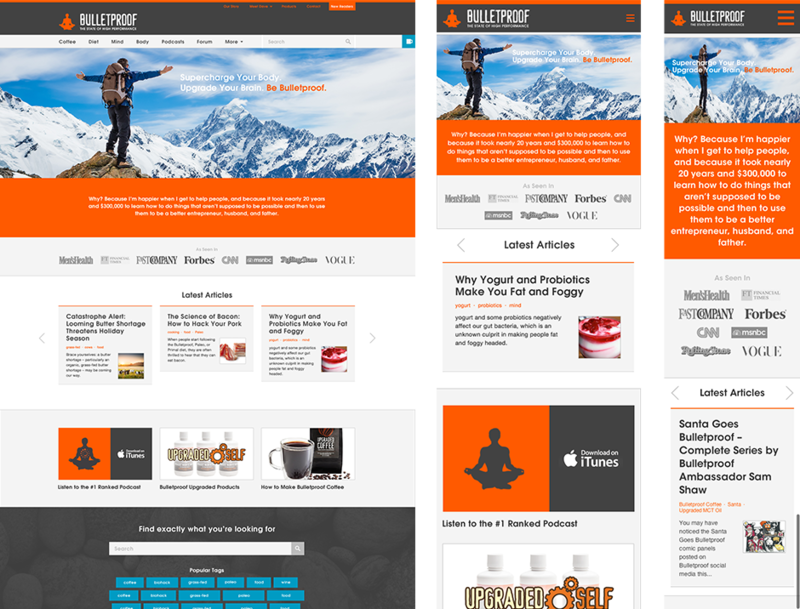 Bulletproof Exec, a highly trafficked blog on bio-hacking, came to DT in need of a refresh. Their intention was to increase email sign-ups, transfer more viewers to the store, and improve reader engagement. Since the redesign, Bulletproof saw the number of email sign-ups jump 300 percent. Awesome! At the start of the project we turned our attention to their audience. There appeared to be two different groups coming to the blog. 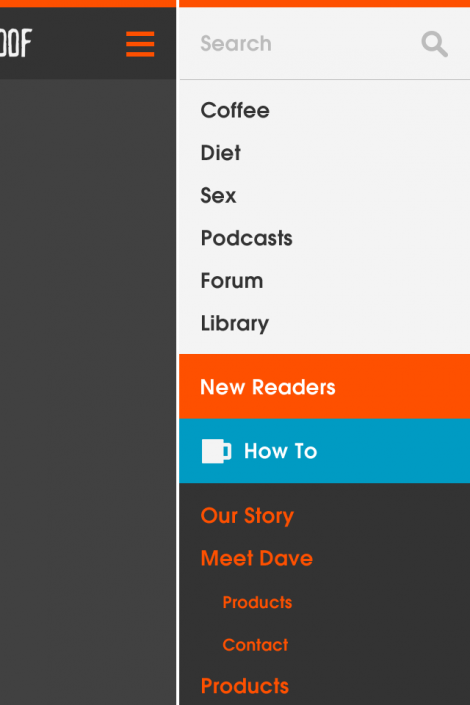 The first we’re regular readers who had embraced the Bulletproof Lifestyle, and were always hungry for more content. However, the second group were the ‘new readers’. They often were coming in via various blog articles, feeling overwhelmed, and bouncing. It was these users we decided to focus on in an attempt to achieve “small wins”. We felt that if they could get a small taste of how Bulletproof improved their lives, they’d be hooked. We started with Bulletproof’s most well known hack; your morning cup of coffee. On every page we provided the reader two informational sidecars. On the right rail was a slider featuring the recipe for their famous butter coffee. In the header was a second slider giving new readers an intro on Dave and his ideology. They were provided five great articles visit and get started with Bulletproof. 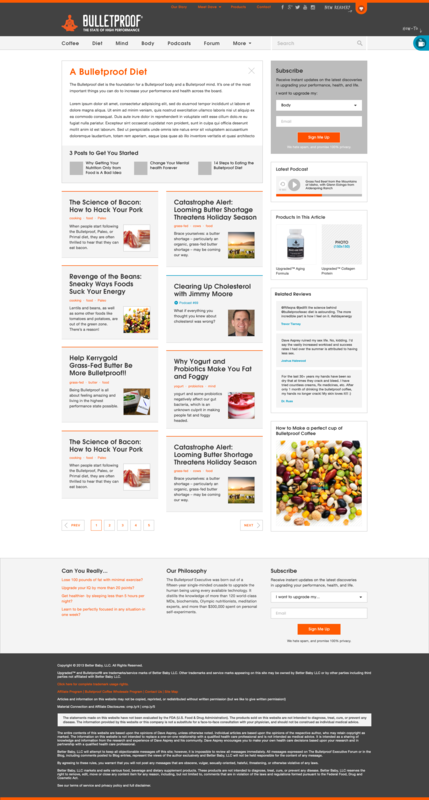 On the blog category pages, we decided to add information to each of the titles. It would only show on first page load, primarily for the new readers, then collapse on subsequent visits. During a team brainstorm, we came up with new ways to market their products. 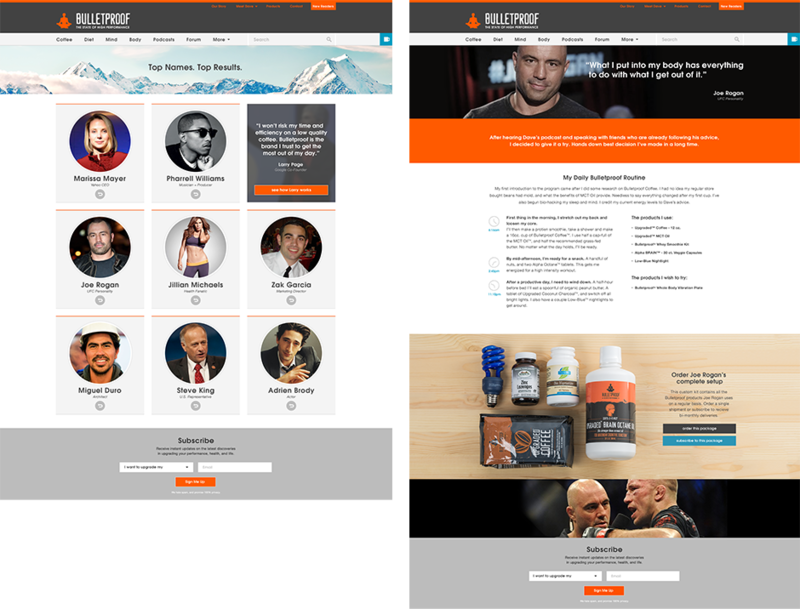 Bulletproof has several high-profile brand ambassadors, so we decided to give them an opportunity to tell their story. Visitors could browse a page of baseball style cards and find an ambassador they connect with. They would then click into their profile page and see a variety of info, including their favorite products and what their Bulletproof schedule includes. We also suggested visitors be given the option to subscribe to the ambassador and receive a monthly package of their favorite Bulletproof products. 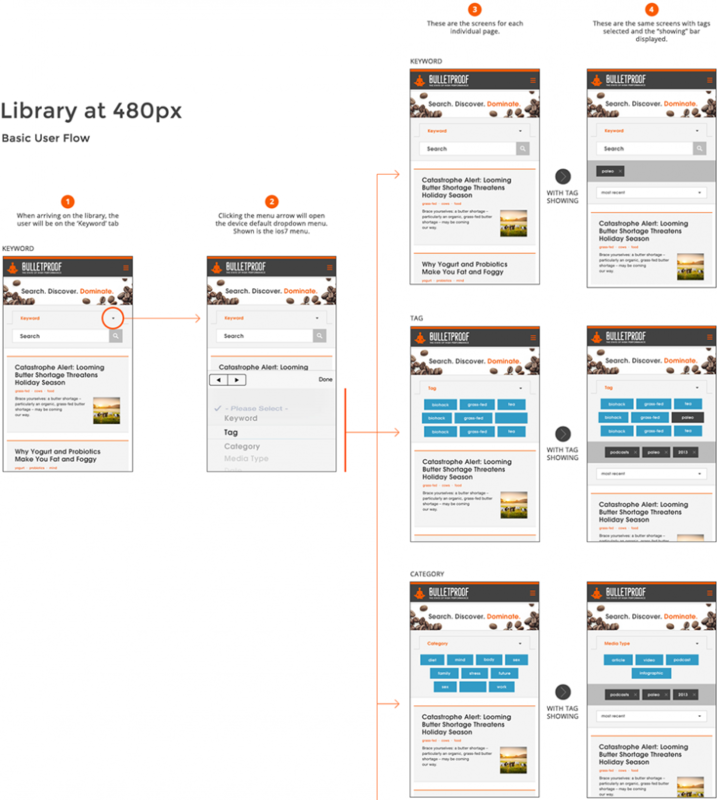 Every page was built with responsive in mind. Special navigation and flows were explained to assist the developers.